sudo rules are in a sense similar to access control rules: they define users who are granted access, the commands which are within the scope of the rule, and then the target hosts to which the rule applies. In IdM, additional information can be configured in the rule, such as sudoers options and run-as settings, but the basic elements always define who, what (services), and where (hosts). sudo rules define four elements: who can do what, where, and as whom. The who is the regular user, and the as whom is the system or other user identity which the user uses to perform tasks. Those tasks are system commands that can be run (or specifically not run) on a target machine. Three of those elements — who, as whom, and where — are identities. They are users. Most of the time, those identities are going to be entities within the IdM domain because there will be overlap between the system users in the environment and the users and hosts belonging to the IdM domain. However, that is not necessarily the case with all identities that a sudo policy may realistically cover. For example, sudo rules could be used to grant root access to member of the IT group in IdM, and that root user is not a user in IdM. Or, for another example, administrators may want to block access to certain hosts that are on a network but are not part of the IdM domain. The sudo rules in Identity Management support the concept of external users — meaning, users which are stored and exist outside of the IdM configuration. When configuring a sudo rule, the user and run-as settings can point to an external identity to be included and evaluated in the sudo rule. However, the sudo rule configuration in Identity Management does not allow the same formatting as the configuration in the /etc/sudoers file. Specifically, Identity Management does not allow whitespaces in the options parameter, whether it is set in the UI or the CLI. However, in Identity Management, that same configuration would be interpreted as different arguments — including the equals sign (=) since it has spaces around it. Instead, each option must be added individually, either through the UI or the command-line tools. Added option "mail_badpass" to Sudo rule "readfiles"
Added option "syslog=local2" to Sudo rule "readfiles"
Likewise, linebreaks that are ignored in the /etc/sudoers file are not allowed in the Identity Management configuration. For example, the same command in the IdM command line has all of the variables on one line and no spaces around the equals sign. Sudo Option: env_keep="COLORS DISPLAY EDITOR HOSTNAME HISTSIZE INPUTRC KDEDIR LESSSECURE LS_COLORS MAIL PATH PS1 PS2 ... XAUTHORITY"
To use multiple sudoers options in Identity Management, configure each one as a separate option setting, rather than all on one line. 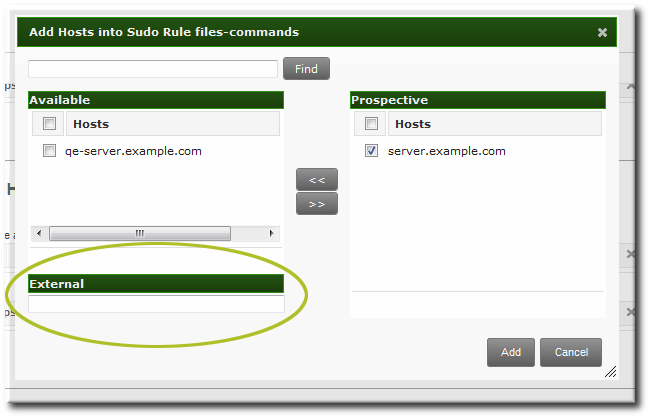 Click the Sudo subtab, and then select the Sudo Rules link. Click the Add link at the top of the list of sudo rules. Enter the name for the rule. Click the Add and Edit button to go immediately to set the configuration for the rule. There are a number of configuration areas for the rule. The most basic elements are set in the Who, Access This Host, and Run Commands areas; the others are optional and are used to refine the rule. Optional. In the Options area, add any sudoers options. The complete list of options is in the sudoers manpage and at http://www.gratisoft.us/sudo/sudoers.man.html#sudoers_options. As described in Section 21.3.2, “About sudo Options Format”, do not use options with whitespace in the values. Rather than adding a list of options in one line, add a single option setting for each desired option. Click the + Add link at the right of the options list. 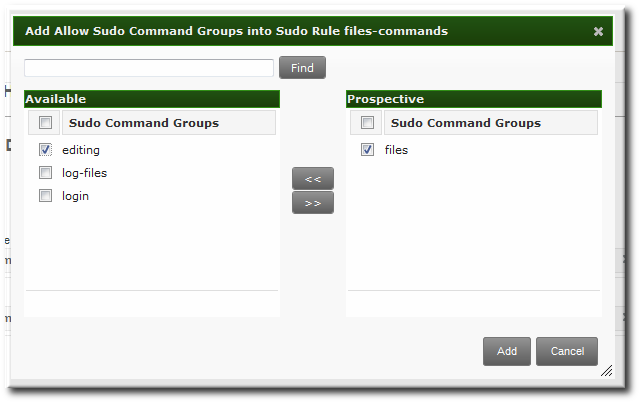 In the Who area, select the users or user groups to which the sudo rule is applied. Click the + Add link at the right of the users list. Click the checkbox by the users to add to the rule, and click the right arrows button, >>, to move the users to the selection box. It is possible to configure both IdM users and external system users (Section 21.3.1, “About External Users”). In the Access This Host area, select the hosts on which the sudo rule is in effect. Click the + Add link at the right of the hosts list. Click the checkbox by the hosts to include with the rule, and click the right arrows button, >>, to move the hosts to the selection box. In the Run Commands area, select the commands which are included in the sudo rule. The sudo rule can grant access or deny access to commands, and it can grant allow access to one command and also deny access to another. In the Allow/Deny area, click the + Add link at the right of the commands list. Click the checkbox by the commands or command groups to include with the rule, and click the right arrows button, >>, to move the commands to the selection box. Optional. The sudo rule can be configured to run the given commands as a specific, non-root user. 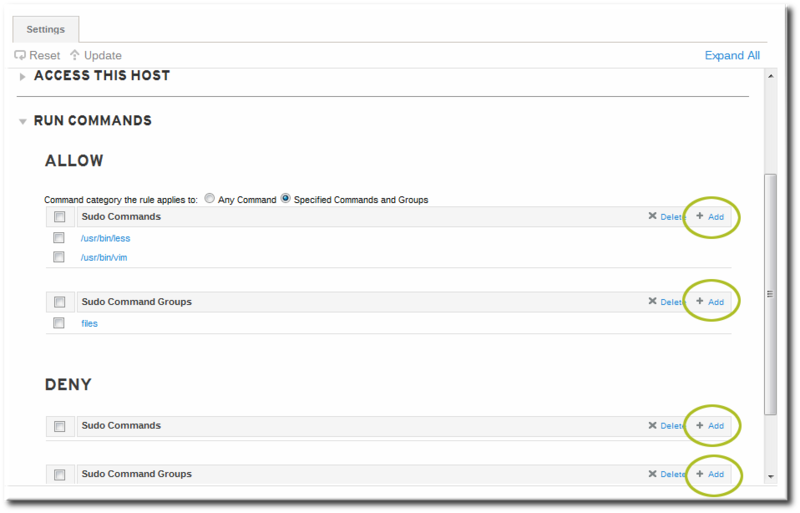 In the As Whom area, click the + Add link at the right of the users list. Click the checkbox by the users to run the command as, and click the right arrows button, >>, to move the users to the selection box. Each element is added to the rule command using a different command (listed in Table 21.1, “sudo Commands”). In the most basic case, the sudo configuration is going to grant the right to one user for one command on one host. The first step is to add the initial rule entry. Next, add the commands to grant access to. This can be a single command, using --sudocmds, or a group of commands, using --sudocmdgroups. Add a host or a host group to the rule. Last, add the user or group to the rule. This is the user who is allowed to use sudo as defined in the rule; if no "run-as" user is given, then this user will run the sudo commands as root. The sudoers file has a lot of potential flags that can be set to control the behavior of sudo users, like requiring (or not requiring) passwords to offer a user to authenticate to sudo or using fully-qualified domain names in the sudoers file. The complete list of options is in the sudoers manpage and at http://www.gratisoft.us/sudo/sudoers.man.html#sudoers_options. Added option "!authenticate" to Sudo rule "readfiles"
The sudo rule also has the option of specifying a non-root user or group to run the commands as. The initial rule has the user or group specified using the --sudorule-add-runasuser or --sudorule-add-runasgroup command, respectively. The --sudorule-add-runasuser and --sudorule-add-runasgroup commands do not support an all option, only specific user or group names. Specifying all users or all groups can only be used with options with the sudorule-mod command. The "who" in a sudo rule can be an IdM user, but there are many logical and useful rules where one of the referents is a system user. Similarly, a rule may need to grant or deny access to a host machine on the network which is not an IdM client. In those cases, the sudo policy can refer to an external user — an identity created and stored outside of IdM (Section 21.3.1, “About External Users”). sudorule-add Add a sudo rule entry. 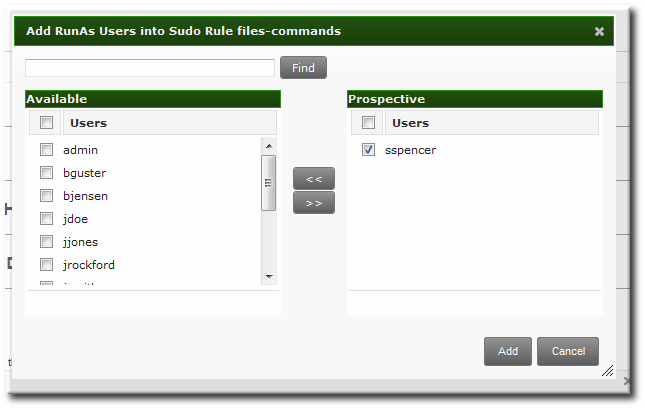 sudorule-add-user Add a user or a user group to the sudo rule. This user (or every member of the group) is then entitled to sudo any of the commands in the rule. sudorule-add-host Add a target host for the rule. These are the hosts where the users are granted sudo permissions. sudorule-add-runasgroup Set a group to run the sudo commands as. This must be a specific user; to specify all users, modify the rule using sudo-rule. sudorule-add-runasuser Set a user to run the sudo commands as. This must be a specific user; to specify all users, modify the rule using sudo-rule. sudorule-add-allow-command Add a command that users in the rule have sudo permission to run. sudorule-add-deny-command Add a command that users in the rule are explicitly denied sudo permission to run. sudorule-add-option Add a sudoers flag to the sudo rule. sudorule-disable Temporarily deactivate a sudo rule entry. sudorule-enable Activate a previously suspended sudo rule. sudorule-del Remove a sudo rule entirely. Obtain a Kerberos ticket for the admin user or any other user allowed to manage sudo rules. Add a new sudo rule to IdM. 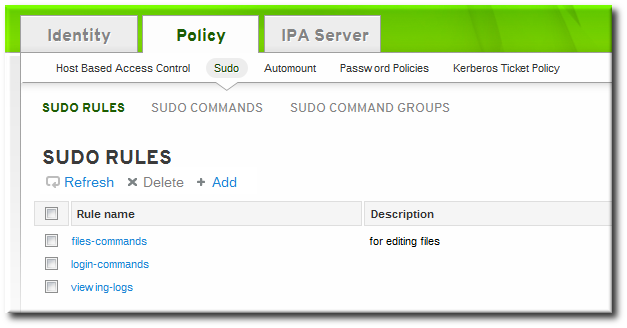 $ ipa sudorule-add new_sudo_rule --desc="Rule for user_group"
Define the who: specify the group of users who will be entitled to use the sudo rule. Define the where: specify the group of hosts where the users will be granted the sudo permissions. Define the what: to allow the users to run any sudo command, add the all command category to the rule. To let the sudo commands be executed as root, do not specify any run-as users or groups. Add the !authenticate sudoers option to specify that the users will not be required to authenticate when using the sudo command. Added option "!authenticate" to Sudo Rule "new_sudo_rule"
Display the new sudo rule configuration to verify it is correct. Defined sudo rules can either be temporarily deactivated or entirely deleted from the web UI or from the command line. Suspended rules are removed from the ou=sudoers compat tree without a need for a server restart.